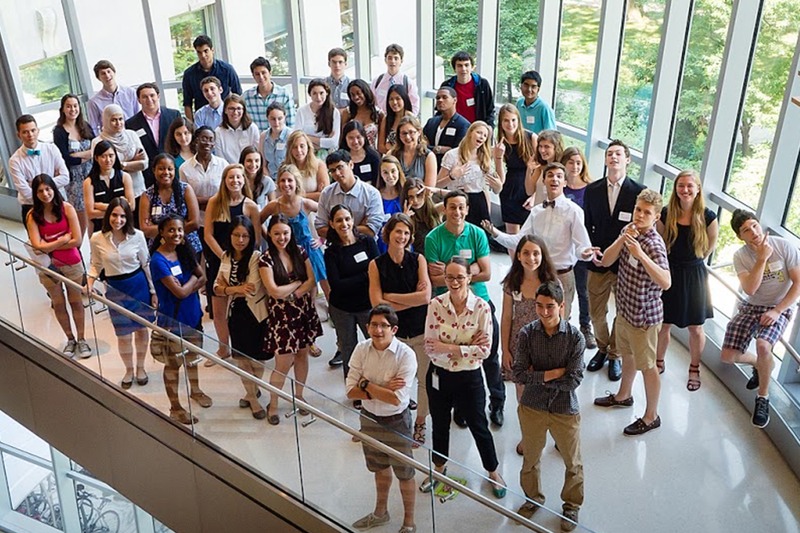 The Rockefeller University Summer Science Research Program (SSRP) provides high school students with a unique and personalized opportunity to conduct hands-on research under the mentorship of leading scientists at one of the world’s premier biomedical research facilities. During this rigorous 7-week program, SSRP students become immersed in scientific culture while gaining an appreciation for the process of biomedical discovery. SSRP 2019 will begin June 24th, and end on August 8th. Through a combination of laboratory experimentation, interactive lectures, and dynamic coursework, students will learn fundamental research techniques, become better acquainted with scientific peer-reviewed literature, and improve critical thinking. Equally as important, students will have a lot of fun—we strive to make the SSRP an inclusive and supportive environment where every student’s voice is heard and respected. Please refer to our Frequently Asked Questions (FAQs) for more information about SSRP. To be eligible for SSRP participation, students must be enrolled in a high school and must be at least 16 years old at the start of the program. No exceptions. Students must also commit to participating for the entirety of the seven-week program. Labs are unable to accommodate students for a shorter period, as it can be time-consuming to properly train a student on laboratory protocols. Lastly, eligible students should demonstrate a sincere interest in science, which must be reflected by official school coursework. Please be aware that the review process for the Summer Science Research Program is extensive. This is due to the nature of the program: each student is individually matched with a volunteer scientist-mentor. A match is determined by a number of criteria, including the personal goals of the student, the needs of the laboratory, and the availability of volunteer scientist-mentors. It should also be noted that while Rockefeller has 75 laboratories, some research, such as that pertaining to infectious diseases or human studies, may not be appropriate for high school summer research. Consequently, acceptance into the program is based on a high score during the application review and on a successful match with a scientist-mentor. Working with DataThis course is designed to provide the fundamentals of biostatistics, instill critical thinking, and guide students through the scientific method as they collect their own data in the laboratory. In this course, students are exposed to a variety of different modes of science communication, and practice scientific writing for lay audiences. For this series, leading scientists and thinkers are brought in to discuss their work, and to challenge students and their perception of scientific applications. Our application process occurs in three phases. Applicants will be notified of the status of their applications after each phase of the review process. During the initial review, each student’s online application is carefully read and considered. Please note that because of the sheer volume of applications received, this process can take between 6 to 8 weeks to complete. After the initial application review, the highest ranked applications (approximately 20 – 25% of total applications) are passed on to the next round of review. During this phase, applications are independently reviewed by a committee consisting of Rockefeller faculty, postdocs, and graduate students. Approximately 5-7% of total applications move into the matching process phase. This portion of the application process is where students come to the Rockefeller campus for an in-person interview with potential scientist-mentors. To identify a match, consideration is given to the applicant’s scientific interests, previous laboratory experience (if any), and the available pool of Rockefeller mentors. Once a potential match is identified, the student and potential mentor will meet to discuss if it is the right fit. An applicant is officially accepted into the SSRP, only after he or she is successfully matched with a scientist-mentor. Thereafter, students will be asked to complete the Student Consent and Agreement Form (both forms signed by the student, parent(s), and a witness) and an official school transcript (to be mailed by the student’s high school). This will all be communicated in detail upon confirmation of a match. The completed online application form. Assume that you have unlimited resources and scientific expertise to create a new scientific technology, or markedly improve an existing technology. What would it be and how would you apply this technology to benefit humanity? At the root of science fiction stories and characters is a scientific idea that has been stretched beyond what is humanly possible. Assume the constraints of reality have been removed, and you can use science to give yourself a superpower. What would this superpower be, and why would you want it? How would you explain this work to a 5th grade student? Keep in mind that the language being used should be accessible. What interests you about the research discussed in this article? What would you do next if you were the researcher? What are the broader implications of this research? School transcript (unofficial/student copy) to be scanned and uploaded online. A current curriculum vitae or resume to be uploaded online. Two letters of recommendations, which must be from a math and/or science teacher. A third optional letter of recommendation (from an advisor, mentor, or community leader), which will be completed online by the recommenders. Students should state a preference for working in particular areas of research (please see section 3 of the application). However, we cannot guarantee that specific preferences will be met. Students are placed through RockEDU Science Outreach, it is not the responsibility of the student to find placement. For a listing of research areas, we encourage you to visit the Research Areas section of the Rockefeller University Website. Applications for Summer 2019 closed on Monday, December 3, 2018.